"5 Stars! So glad we had Meredith photograph our son’s adoption finalization. The photos are spectacular and perfectly capture the joy and emotion of the day. It also helped that she has been through one of these ceremonies herself. She knew what to expect and even talked us through some of the process. It was the best decision to hire her. Thank you, Meredith!" As an adoptive parent myself I know how much work it is to go through the adoption process. As a professional photographer and designer I use my personal adoption experience combined with my professional skills to create meaningful and impactful images and designs to make your profile stand out. Adoption Profile Photography Session - photos of your family in your home and local surroundings. Clients use these images for their adoption profile books, online profiles and adoption home study requirements. 45 minute session, high resolution files on USB $495. Hard or soft cover books that show prospective birth parents how your family lives, how a new baby will be welcomed, your parenting philosophies and more. I provide a well designed book of photos and text that brings your family details to life! Your Adoption Finalization Ceremony is a unique celebration of your newest family member! Whether it is just you and your baby or your extended family in the courtroom you will want to have visual memories of this event. I would love to be there to document the moments. Then we can head outside for a mini family photo shoot in front of San Francisco City Hall! Every child has a story but adopted children have a special need for their origin story to be collected and available to them in a easy, visual, and lasting format. Whether your family has a closed or open adoption story, all the pieces of the puzzle can be laid out in a designed book for your child to refer to as needed. It helps parents have those difficult conversations by providing a colorful storyboard of your child's life to look at. 5 Stars! Meredith Hanafi is an amazing photographer, and so easy to work with. I was excited to submit my adoption paperwork to our agency, but the following week learned that our photos had “failed” because they weren’t professional enough for the flyer that the agency put together for each client. I called Meredith, and she sensed that I was really bummed. She offered to meet my husband and me in a local park the next day for a photo session. I should be embarrassed to admit this next part, but because it’s Meredith I’m going to share. 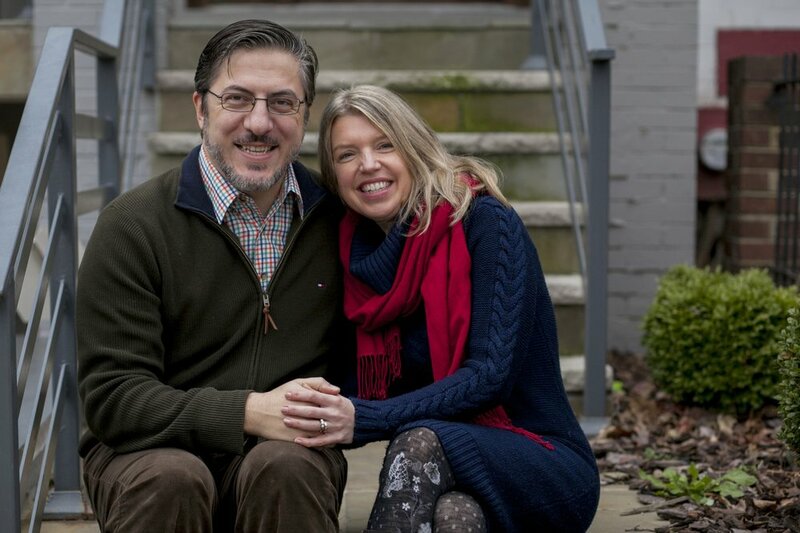 I guess my husband and I were kind of mismatched in the way that we dressed, so Meredith literally gave me the shirt she was wearing (we did a quick switch in the park bathroom) and the photos turned out great. I don’t think a lot about colors matching, and I definitely was not psyched for a photo shoot. However, Meredith just kind of chatted the whole time and before I knew it, the session was over, and we had some really fun shots capturing genuine laughter and our “real” expressions. I can’t say enough great things about Meredith and her work. Best of all - we got a call within a few months, and the birth mother said she liked our photo in the park, and that we looked happy. Our daughter is now three and a half. - C.C.